In recent years, the population of people living in the city centre in the UK has risen significantly. City centre living in the UK has always been popular in London, but more recently, the city centre locations of cities up North like Manchester, Liverpool, Leeds, and Birmingham have seen some of the fastest growing populations in the years between 2002 to 2015. 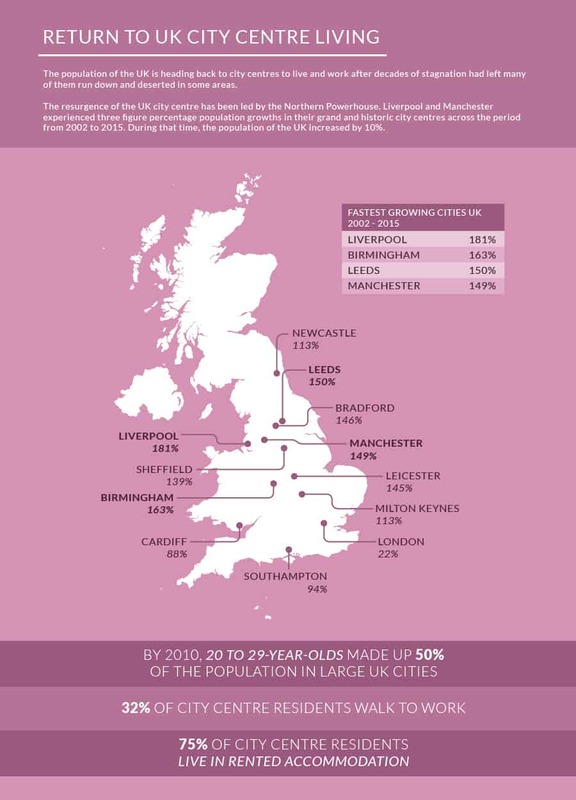 Research suggests that a large number of people living in the city centre are young people, with 50% of the population of large UK cities being in the age bracket of 20-29 in 2010. 75% of city centre residents live in rented accommodation, whilst 32% of city centre residents walk to work. This is good news for property investors looking to invest in buy to let property in the city centre of Northern cities, suggesting high demand for quality rental properties. Check out this infographic from property experts RW Invest which outlines these facts and figures in more detail.